After hearing about and seeing all of the beautiful circle journals from my circle of friends group, I decided this year to participate in the fun. It was hard to narrow down an idea of what I wanted each person to do but, with the help of Lilian I decided on the theme of "A Creative Journey". 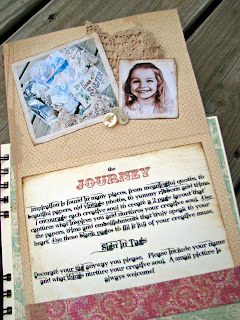 With circle journals you can include rules or guidelines, color schemes or specific pictures, etc, but I wanted it to be a journey of each participate's creativity so I didn't include many rules at all. Little did I know how much creativity would mean in my life. 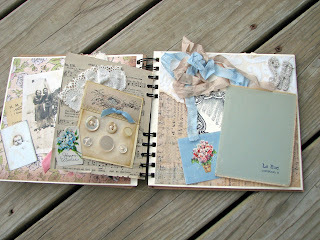 I have made so many wonderful friends through scrapbooking and mixed media art. It is so wonderful to talk the same creative language. To really know that someone gets why you love to feel a textured sheet of beautiful paper or a velvet ribbon or that antique lace that you just have to have for your collection. I have been blessed to become friends with many ladies in this incredible journey from across the United States and Canada. That is what is so amazing about blogging, you can meet kindred spirits from around the world all from you home. Each page has trinkets and treasures from many of my friends, some that were given, some that were bought, some that I got on trips with my sister and friends. A few Silver Bella memories tucked in. 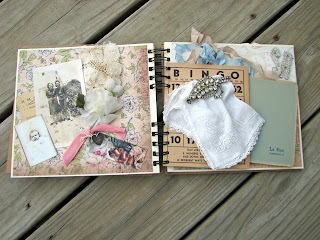 So the piece of art journal that I created is so meaningful to me. 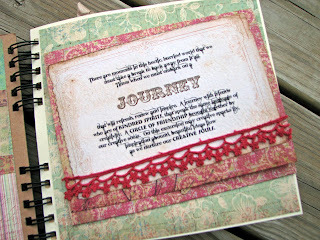 I hope the other ladies fill this creative journal with a little bit of themselves to share with me. Amazing. I just love them all. That is going to be such a keepsake!! What an absolutely exquisite book! 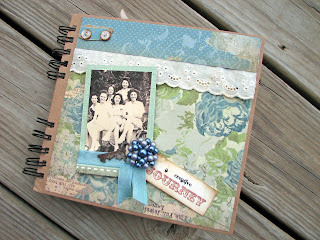 Perfect way to hold such fabulous memories!